Bring a cup or two of water to boil. Add in the broccoli and cook till done. Then add the spinach and spaghetti. Once those are thawed and warm, turn off the heat and drain. In the meantime, heat a saute pan and add olive oil. Then shallot, garlic, red chillies until slightly browned. Add sundried tomatoes… Then the veggie/noodles, stir well. Heat another tsp of oil and add to it the italian herb blend, then the panko bread crumbs and heat until they are toasty. 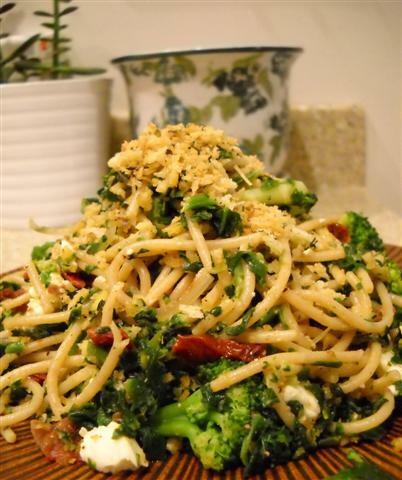 Sprinkle on top of the noodles, along with nutritional yeast and feta cheese. Voila! This is my entry for Presto Pasta Night hosted this week by The crispy cook. And also for Vegetarian Foodie Fridays.